I am getting so close to the end of my craft room makeover madness that I need to show off some of my work. 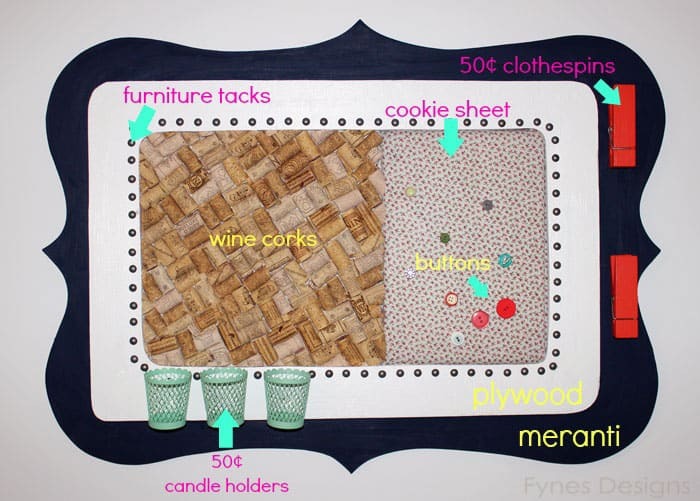 Plus, this frugal cork board was a perfect snowy day (yes, I said snowy… in April (and yes I live in Canada)) project. Feast your eyes on my new frugal friend. I only spent about $4 making this memo board!! Many of the supplies I had on hand. However, if you had to go out and buy everything you would spend about $20, still, that is a pretty cheap project for a substantial piece of useful wall decor. 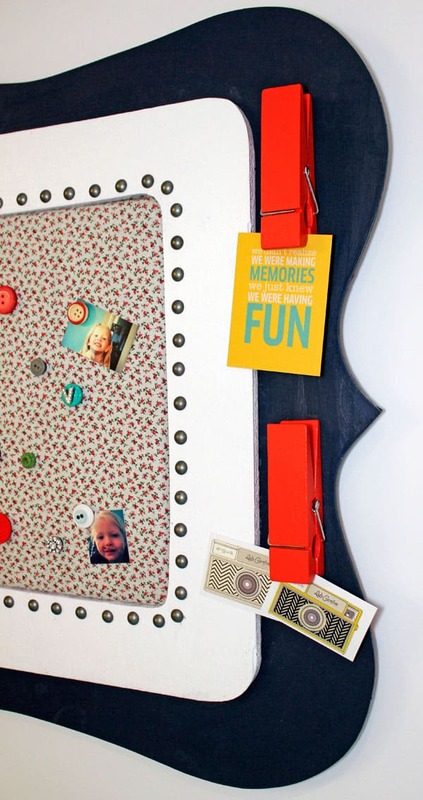 This cork/ magnet combo is perfect for my craft room, loads of space to pin pictures, magazine clippings, and reminders. Plus, the little cups will hold a few tools, and pencils. The cookie sheet was destined for the trash, so I added a bit of fabric and gave it a new life. 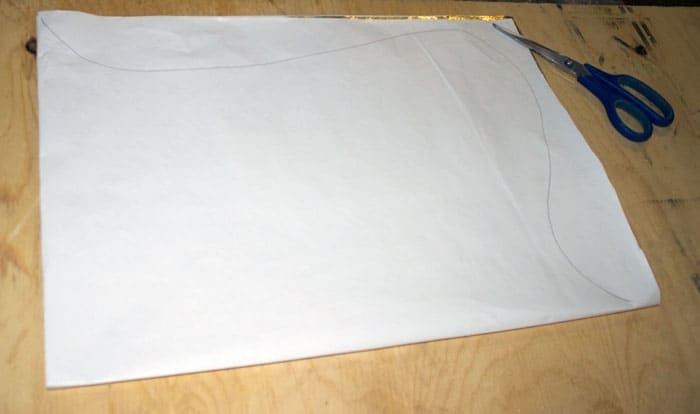 I created the stencil for the back piece of meranti by folding a piece of wrapping paper in quarters and free handing the curves. This way when cut out all sides will be equal. Then cut it out with the jig saw. I simply glued magnets on buttons with E6000. The wire candle holders and the large clothespins are from the impulse items at Michaels for only 50¢! What do you think? 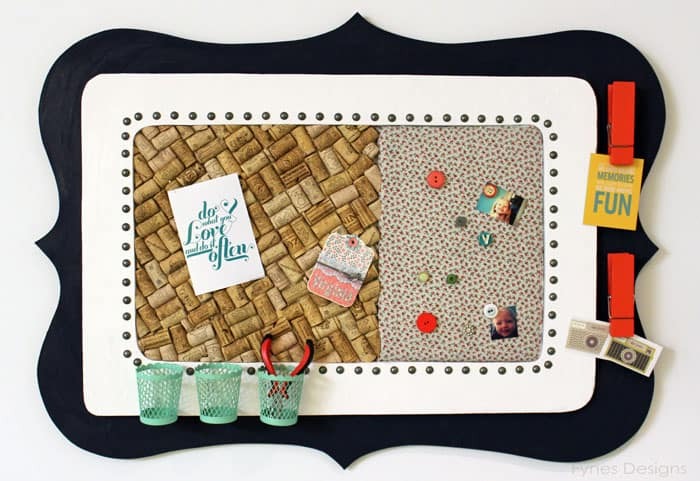 Do you have any trash worthy supplies, that could be made into a pin board? I can’t wait to show you the rest! Love, love, love it! Can you give me the dimensions? It looks quite big. I love how you added the candle holder cups! Thanks Claudine, It is about 2′ wide and 3′ long. Substantial, it fills the wall really well! You had me at “frugal”! 😉 This is totally adorable. I found you at I Heart Nap Time– thanks for sharing! This board is so cool! Very creative. I love the button/magnets. I’m visiting you today from Happy Nifty Thrifty. I hope you get a chance to stop by my blog and leave a comment and Link Up, too! What a fantastic diy project. Looks great and so functional. Oh yay! I’m so happy I came across this. 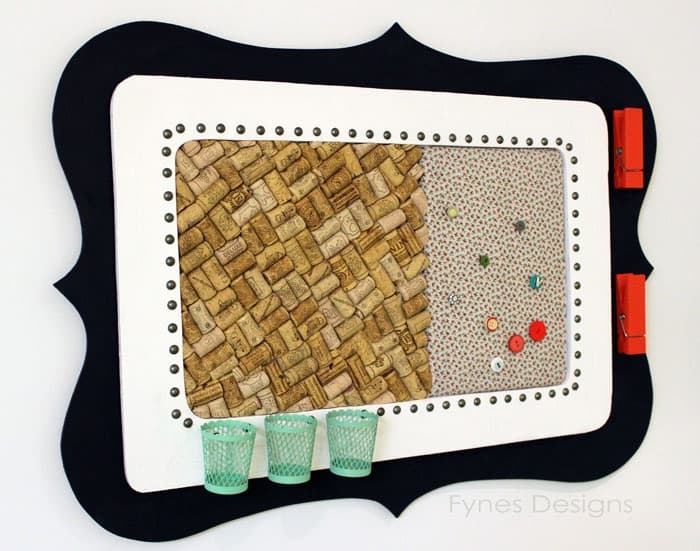 I’ve been putting my corks away in order to do something like this. Perfect. Love this idea, and definitely have to pin it! I am a frugal crafter so love the inspiration. What a great idea! I love it. The wine corks are my favourite part. This is absolutely gorgeous! I love the shape of it and all of the different materials you used. So creative! I’m not very DIY, but I think I could handle this. Pinning for when I get around to spiffing up my home office – thanks! Visiting from SITS – have a great weekend!